cobblestone streets, buildings with faux painted exteriors and loads of character. Note the painted cat on the faux painted trim between windows! In the midst of this lovely place is a wonderful hotel, HOTEL MONTEROSA. It was founded by the Bacigalupo family in 1909 as a restaurant. And it grew into so much more. and a moped are parked. My single hotel room has ample space, modern amenities and air conditioning which is a gift from the gods on a hot July day. The desk area includes a beach bag with towel and a place for me to write. Did I mention that they have a pool and jacuzzi? This lovely oasis sits amid shopping in Centro Storico as well as other homes, apartments and churches galore. And nearby it is always surprising to see farmland. This is less than a 50 meter walk from the pool. An antique gate is adjacent to the hotel and the pool. You do not find object d’arte like this at most seafront hotels. As far as the seafront goes, Hotel Monterosa has a free shuttle to and from whichever beach you want to visit. Check the times and then wait in the well-appointed lobby for your ride. There is also a bar adjacent to the lobby where you can sit inside or out with a caffe’ or an aperitivo. In minutes on your shuttle you will arrive at the sea in Chiavari. And her rocky shores, full of locals and only a smattering of tourists. This is a place to experience the sound, scenes and scents of the sea. 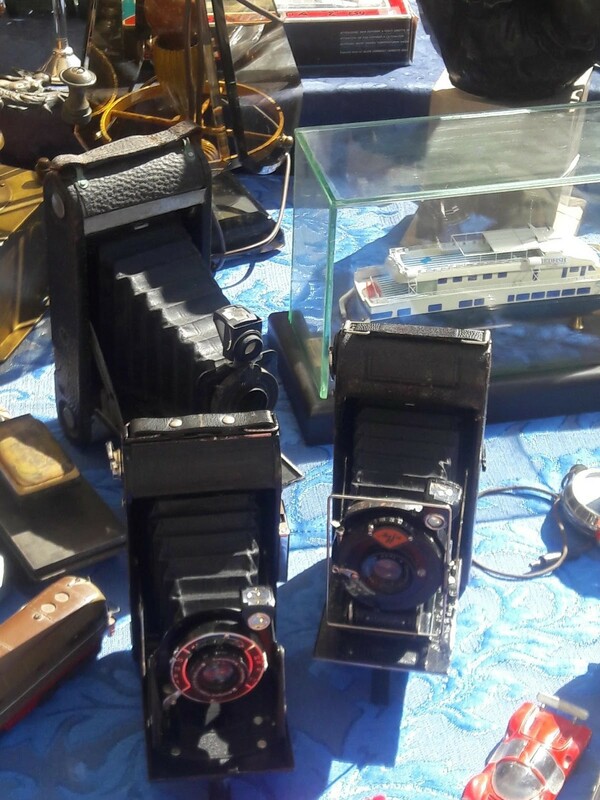 Or experience the antiques market on the 1st weekend of the month. Or Camogli in 30 minutes by train. The train to Rapallo by the sea is less than 10 minutes. From either Rapallo or Chiavari, you can take a lovely ferry ride to the exclusive hideaway of the rich and famous at Portofino. Where the Big Boats live. And do NOT forget the heart of the region, Genoa, called La Superba. The city is huge and superb. The Port is also a great experience. All these things you can visit within less than an hour from Hotel Monterosa. Did I mention that there is a excellent, maybe superba, restaurant here at Hotel Monterosa? I was quite surprised by the quality of the food, the wine and the service. It was an exquisite sensory experience for me. First, they serve on the terrace outside and inside in the dining hall. It was so hot that night that I chose to sit in the air conditioning and enjoy my meal. Crystal chandeliers hung from the coffered ceiling which was partially painted rosa (pink). A vegetable buffet was included with every person’s meal. I enjoyed a mixture of grilled veggies topped with Extra Virgin Olive Oil and Aged Balsamico from Modena and it was delicious. I decided to order for my primo piatto, or first course, a traditional stuffed pasta dish of Liguria called pansoti along with un bicchiere del vino bianco (a glass of white wine). The pasta was stuffed with greens and the sauce was a cream sauce with walnuts in it and on it. It was so flavorful and the presentation was beautiful. Of course, the waiter added Parmigiano Reggiano to it. For my second course, or secondo piatto, I ordered the fresh caught fish of the day, Branzino, fresh sea bass, Ligurian style. Again, the presentation was fantastic. The sauce contained tomato, balsamico, olive oil, green olives andpignoli,pine nuts. There were decorative and delicious mashed potatoes with red currants as well as a sliced, baked potato in the sauce. Another waiter plated it all for me. It was astoundingly good. Of course, I was stuffed. But there was a dessert selection included in the meal. I chose the Mango cake with a meringue topping-delicious. I finished my water and waddled back to my room. It was a wonderful day of great service, wonderful people and food and drink to remember. Sunday morning, I was awakened by the sounds of chimes and church bells calling the faithful to mass. It was a melodious way to start the day. I dressed and enjoyed a lovely breakfast before going out to la piscina, the pool. Notice how the other surrounding architectural buildings are reflecting on the glass doors. As an anxious, overweight woman, I was nervous in my swimsuit. But after sunning and swimming I relaxed and stopped worrying. Then I decided to go into the jacuzzi to further relax. Unfortunately, I misjudged the depth of that first step and fell into the whirling water. I did injure myself and was very embarrassed. However, the guests and staff were so very helpful. I do not always expect to be treated with such kindness. But here, the people really do care about your well-being. Soon, staff members and guests helped me out of the jacuzzi and back to my lounger. Staff members brought ice and a foot wrap. A guest who was a nurse suggested a wider wrap and off they went to buy it at the farmacia for me. After I relaxed a bit and the ice was helping, staff members helped me to walk around the building to avoid the stairs, escorted me to my room and helped me get situated. I received my pillows and ice and everything nice whenever I asked for assistance. Just think of how they will treat you as a normal guest. The next morning the staff arranged a ride for me to get an X-ray of my foot and set up an appointment for me. After walking around my room for a day I discovered I had broken a metatarsal bone in my foot. Again, they arranged a taxi for me to go to the Orthopedic Doctor on Tuesday for a cast or a boot. They also set up an appointment for me to talk with their insurance company. I did not ask for that. They offered. It is amazing how the people I have met in Italy have been such good people. And this hotel is full of them. My last night at Hotel Monterosa, I chose to splurge again on the restaurant. This time I tried another Ligurian specialty called Ravioli Antica Genova, Antique style Genovese Ravioli. These little pillows were filled with beef, mushrooms and tomato. The sauce had the same ingredients and pine nuts too. The ravioli sat in bowl made of fried Parmigiano Reggiano. The presentation, the flavors and aroma were beyond what I had hoped to ingest. My dolce for this night was magnificent. It was a lovely torta, cake, with cream center, fresh strawberries, white and dark chocolate. It was so good I had to take a bite before the photo! The next morning it was time for me to check out of the hotel and visit the Orthopedic Doctor. 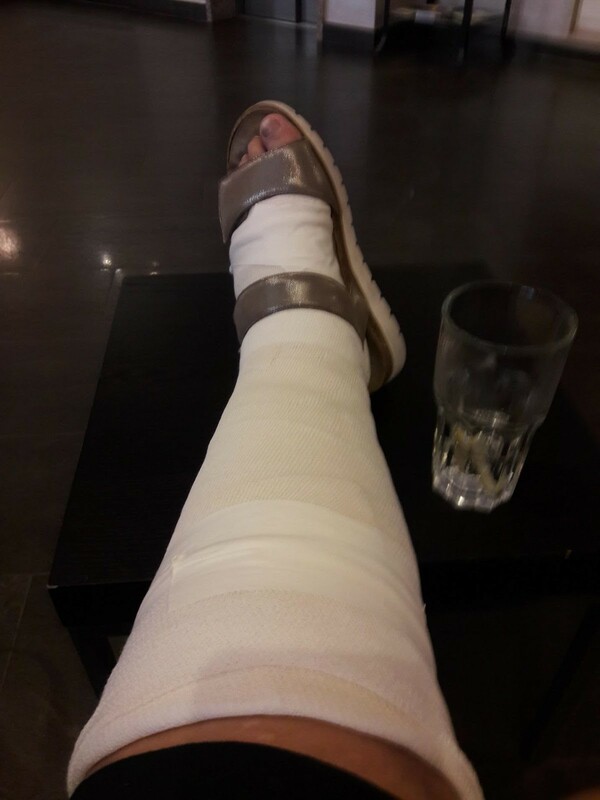 I was very nervous because I did not want to have a cast on my foot. I have had blood clot issues and need to constantly have circulation, especially when flying. And I will be flying two airplanes back to the USA in just 2 weeks! Again, with the help of friends and of the staff at the hotel, I was able to explain all this in Italian to the doctor. Il Dottore was very helpful once he understood the risks. I now have a tight wrap on my leg for thirty days and I begin a regimen to thin my blood today. I am styling and at least part of me will be thin. Not my leg or foot—just my blood. I have so much respect for their service provided by all members of the Hotel Monterosa staff. 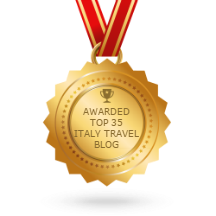 I would highly recommend to you to stay at Hotel Monterosa any time you are in Liguria. I was the only one I know of who was injured while staying there. Yet, everyone I met and all that I witness proved to me that the way they treated me is how they treat everyone. At this hotel, Elisabeta, one of the managers, is the granddaughter of the two people who began this business in 1909. It is still a family run business. And they make you feel like you are part of that family. One caveat: if you are going there to sit on the internet you may find it a bit difficult. Homes and hotels in Centro Storico have this problem. It seemed to be the best in the lobby and outside on the terrace by the pool. Go there on vacation. Leave your electronics and experience La dolce far niente, the sweetness of doing nothing. You will not regret it. You can book directly on their website at: www.hotelmonterosa.it. Or let me do it for you. That is what I am here for. Come to Liguria. See me in Chiavari. I promise you will enjoy the splendor and simplicity of the life here along the Mediterranean Sea.